Wesley So plays 51.Rd7+! and tricks Timur Gareyev. | Photo: Lennart Ootes/Saint Louis Chess Club. As winners in the second round, Sam Sevian and Wesley So joined Jeffery Xiong in the lead at the 2019 U.S. championship. Carissa Yip and Jennifer Yu are tied for first place in the women's tournament. "First of all it was a very tough game. I played very badly today; didn't get much chances," said Wesley So, who managed to score the full point against Timur Gareyev from a position that everyone expected to end in a draw. "I didn't want to accept the draw right away although of course it's a total draw, he has multiple ways to do so!" said So. Wesley So's perseverance eventually paid off. | Photo: Lennart Ootes/Saint Louis Chess Club. It was indeed pretty incredible if you look at the position after move 26 and realize White is actually going to win that. It was all about finding the remarkable 47.Nf6 move and the tactic that belonged to it. Gareyev just got tricked! | Photo: Lennart Ootes/Saint Louis Chess Club. Gareyev is now on 0/2. Chess is tough! He did keep his spirits high though, giving an interview after the game and explaining how he will deal with it: I am going to win tomorrow!" His strategy for his game with Aleksandr Lenderman: "Throw all my pieces at him!" Timur Gareyev is one of those players who is not deeply affected by an unnecessary loss. | Photo: Lennart Ootes/Saint Louis Chess Club. The sharpest Sicilians sometimes fizzle out in a quick draw. That's what happened in Leinier Dominguez vs Sam Shankland, but not without a big moment on move 20. There, White was winning for the course of just one move. Dominguez failed to calculate what was a difficult line where White needs to combine attack and defense. "Maybe I underestimated my position," he said. 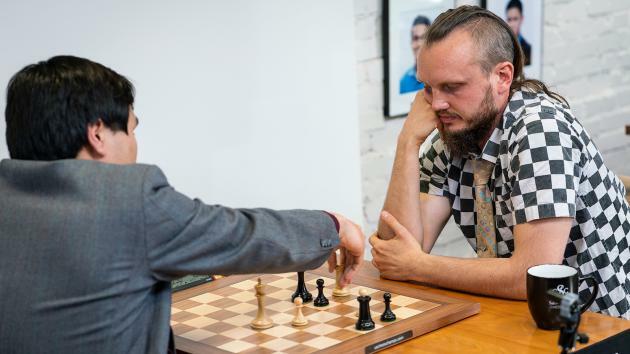 It looks like Sam Shankland was lost for one move. | Photo: Lennart Ootes/Saint Louis Chess Club. Sam Sevian got a huge advantage out of the opening against Awonder Liang and ended up winning, but only after 77 moves. "I just couldn't find the knockout punch," he said. "He was defending extremely well." This way we did get to see a very interesting game and Sevian showed a number of fine tactical moments, which are included in the analysis below. Sam Sevian, one of three players on 1.5/2. | Photo: Lennart Ootes/Saint Louis Chess Club. The women's tournament saw a quick, decisive result for a game that had a peculiar end. What happened was that FM Akshita Gorti got in trouble vs FM Carissa Yip, but just when she was OK again she resigned...in an equal position! Since January that has been known as "doing a Shankland." "I was pleasantly surprised," said Yip. She revealed that she saw her mistake while her opponent was thinking, and didn't expect her to resign. "After I played 22...Bh3 I realized I should have done 22...Bd4+ first." Carissa Yip.| Photo: Justin Kellar/Saint Louis Chess Club. The other leader after two rounds is FM Jennifer Yu. She defeated WIM Ashritha Eswaran from a Benoni, an opening she did expect to come on the board, but then she forgot part of her prep anyway. Yu: "I just did something random. I just played the game." Anna Sharevich looking at Jennifer Yu's position. | Photo: Lennart Ootes/Saint Louis Chess Club. The official broadcast of round two.